With its tea room serving garden-grown delights and literal labyrinth to meander through, this is our dream destination right now. Nova Scotia's Annapolis Valley is known for its natural beauty: the high tides of the Bay of Fundy, gorgeous vineyards and its ability to grow the most delicious produce. Nestled among the countless wineries found in this fertile region is a hidden gem not be missed, Tangled Garden. 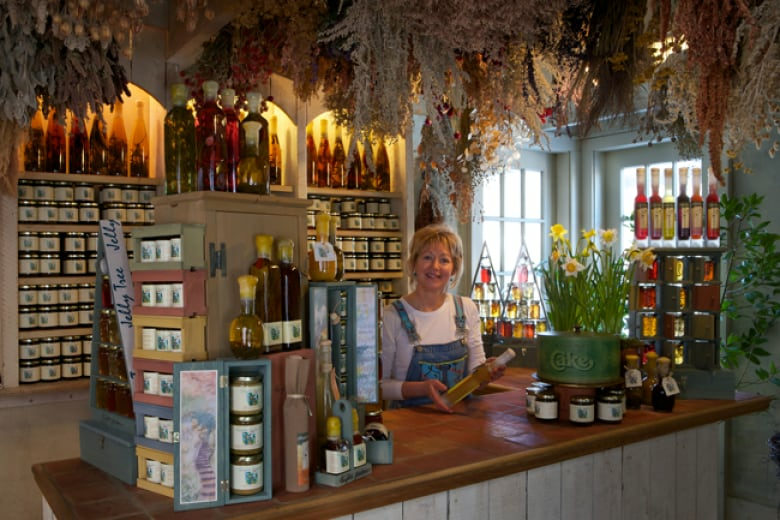 Beverly McClare's seaside space is an edible landscape that produces gem-like herb-filled jellies, jams, vinegars and liqueurs, inspired by and harvested from the garden itself. For over 20 years McClare and her team have cultivated a must-stop spot in Grand Pré, just an hour outside of Halifax. 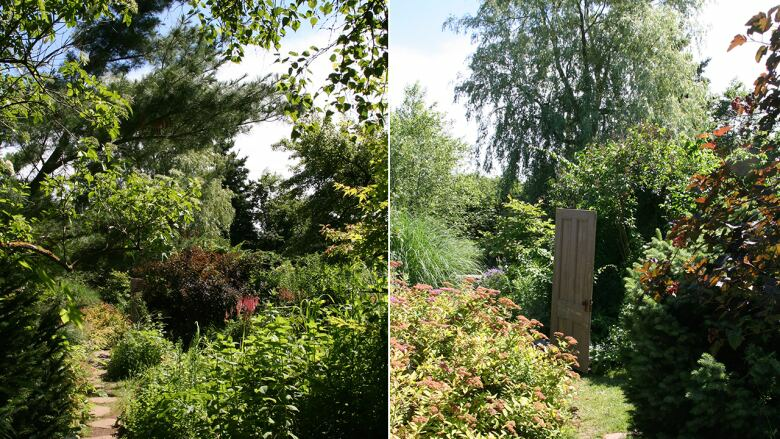 Upon first glimpse, it's hard to believe this 4-acre space started as a 4 X 4 foot herb garden. Beverly McClare grew up in rural Nova Scotia and has a restaurant background, that she credits for helping to spark her love of herbs, which she points out weren't as prominent in everyday Canadian household cooking as they are now. "Growing up in the '70s, it was maybe dried oregano on pizza," she explained. It was a serving of Nova Scotia chowder at the restaurant where she worked that made her start to see of herbs in a different way; as it passed by her on its way to a table, she got a whiff of the parsley on it and was mesmerized by the scent. At lunchtime that day, she had a big bowl of it for herself and for the first time really took in the flavours the herb. She got her start in herb vinegars, explaining to me that "herb vinegars in the '80s were as hot as balsamics are now." She walked into her kitchen one day and there, glimmering in the sun, was a bottle of tarragon vinegar that started her journey into her own business. "It really set my imagination on fire," McClare recalls, thinking, "'Oh my god, it's going to be enchanting'." And enchanting certainly describes the space today. 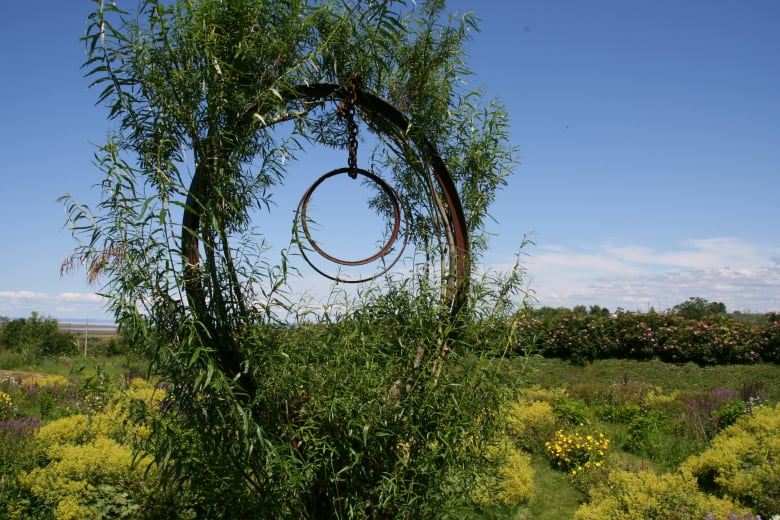 Upon arrival at Tangled Garden today, guests are met by a massive weeping beech, towering over the entryway and the shop where those jellies are sold, and where visitors begin their tour through the garden she and her team have been cultivating for decades. You can sign up for a guided tour with McClare herself or grab a map and meander at your own pace. Either way, I highly recommend getting a scoop of house-made ice cream to accompany you on your stroll. You can choose from flavours such as rose petal and chocolate mint, both infused with herbs and florals from the property. 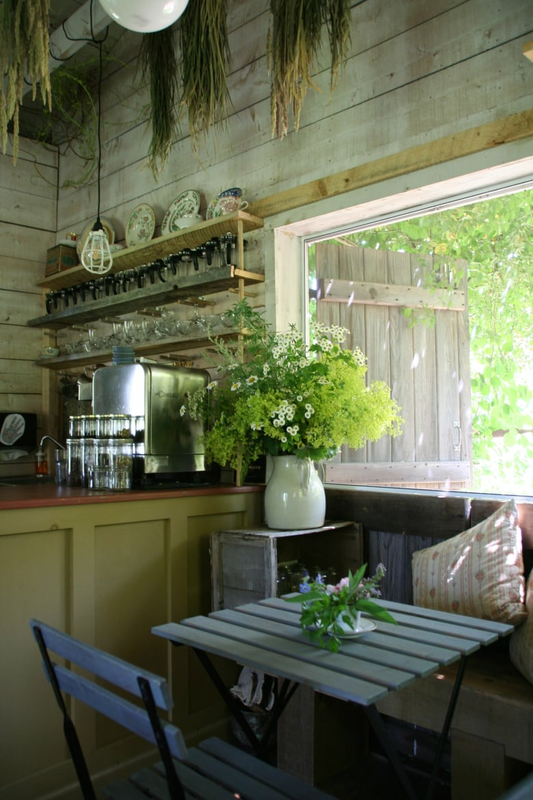 Remove the paper lid from your ice cream cup, unwrap your wooden spoon and embark under a pergola tangled with wisteria. The fit of the garden's name quickly becomes apparent; this somewhat wild and incredibly captivating place gets its name from a painting by Group of Seven painter, J.E.H. MacDonald entitled of the same name. Stone pathways to the right lead you through a canopy of shady trees. Wooden doors await for you to enter onto spaces green sections with names like The Reflection Room, The Quiggly Fence and Pear Bench, and the Tossed Salad Room — a section of raised willow beds that McClare hand wove herself, that house a variety of lettuces. When I asked her to share where she drew her inspiration from for the landscape, she eagerly shared that she'd been "haunted by a movie" since childhood only find it again in adulthood and realize it was The Secret Garden. Scenes from the movie have characters untangling the landscape, and you can see the inspiration for the wild landscape here. "When I need to use a machete [to get in] then I will be done," she says. I ask McClare about her approach to taming the plants and she says she must give credit to the gnomes and fairies: "I always tell people I don't have much control of the garden anymore, they just leave me a list." In actuality, the space has evolved slowly. At the beginning, she and the kitchen staff were the only weeders. Today she is clear that the wonderful people she works with are to be credited for the gorgeous landscape, thirty years in the making. Lisa Boehme, Nina Newington and her dedicated team that they consider "their little nest" are proof that you need to surround yourself with people who have strengths to complement your own. They have embraced what many would call weeds and adopted the "If you can't beat 'em, join 'em" approach." After all, those unintended plants are often natural pollinators. "Why would you pull those out?" she wondered aloud. One stroll might take you along a dry creek which runs eventually to a pond full of waterlilies and fish, with plenty of lavender around you, and if you time your visit right, a trellis overflowing with roses. She also looked to the work of Piet Oudolf, famous for garden design and leading the "new Perennial movement", and designing the High Line in NYC, and to Sarah Price, an award-winning garden designer from Britain, for inspiration. Continuing my tour, I wandered back to the grassy path I'd started on and then headed down Lavender Lane, where I found myself among rows upon rows of herbs. The team picks fresh herbs from the garden every day through growing season, and those find their way into an assortment of beautiful edibles. 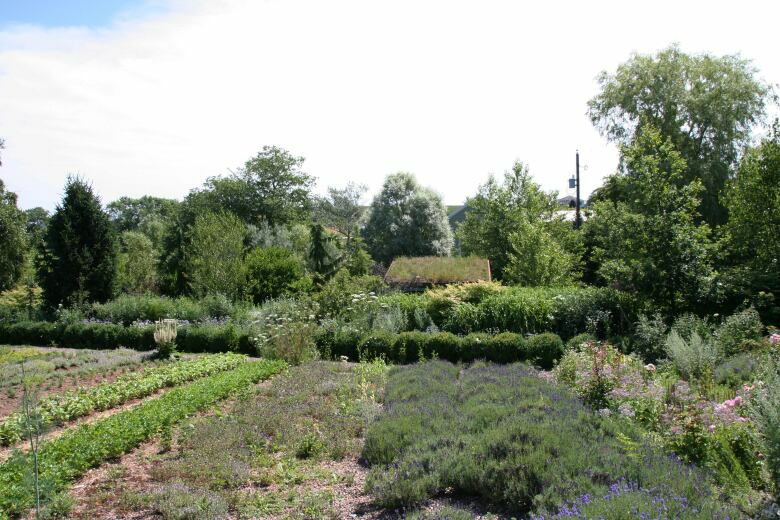 It seems as though the preserves are a natural, organic extension of the garden. Aside from the gnomes and fairies having a say in things, the jellies and other beautiful edibles that the kitchen produces each summer do influence how the garden evolves and they do dictate some of the planting. It's a classical seven-circuit labyrinth, which is an ancient, single-path design. It was added to the landscape in 2004, and is meant to be a contemplative stroll through wildflowers that serves as a form of mediation. As the brochure points out, "From the centre of the labyrinth there is a long view across the historic dyke lands of Grand Pré to the Minas Basin." I headed back to the Tea House. Reminiscent of a potting shed, with its clay pots and walls of sun-faded boards, there are bundles of dried herbs and grasses hanging from the ceiling, that lend a sweet, summery scent. Hosted by Beverly McClare and Lisa Boehme, it's a place you can sit and enjoy the treasures of the garden while you look out onto the property. Guests can sample jams and jellies, sip on local teas and snack on homemade treats from a local bakery. The fresh, herbal flavours bring you back to your afternoon meandering down those paths. At the end of my tour, I visited the shop. 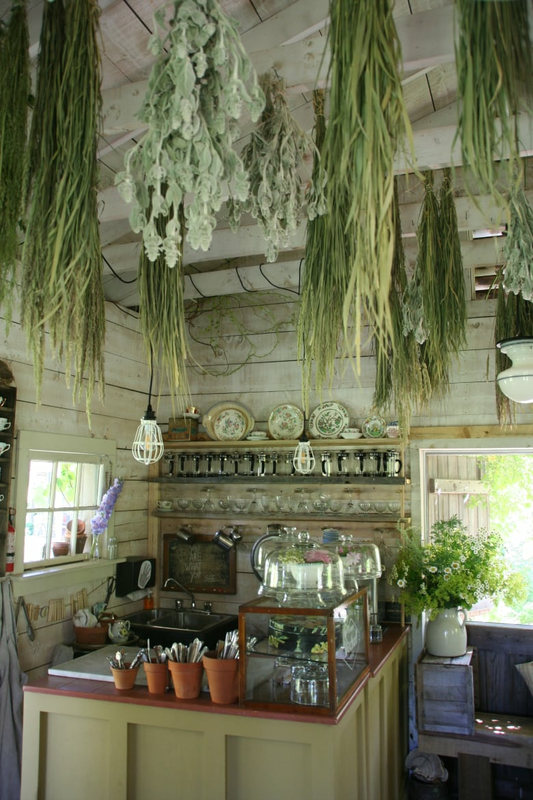 Dried grasses hang from these rafters as well, and bunches of lavender are scattered throughout, sometimes overshadowed by the smells coming from the the kitchen at the back. 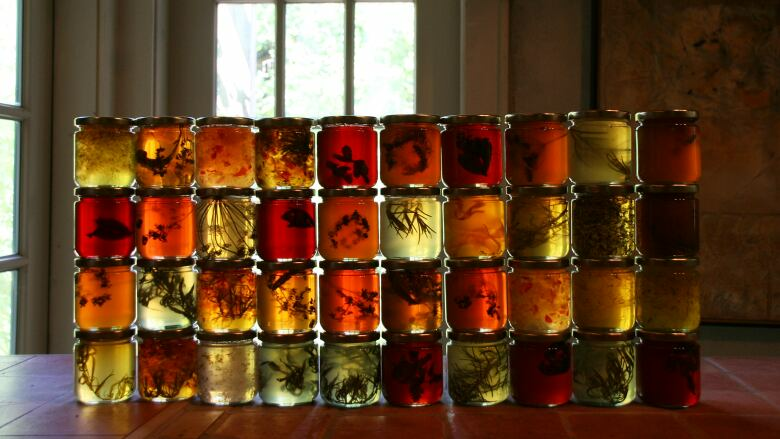 Walls of herbal jellies, jams, honeys, liqueurs, cordials and more line the walls and the sunlight makes them glimmer. From the edible landscape, they are able to craft such unique and somewhat unexpected flavour combinations such as Strawberry Rose Geranium jelly or Grape Basil jelly. McClare explains that the combinations come to the team through playing with different pairings. "Sometimes we make a traditional jam, throw a few things in and do a taste test. And then comes the play." These tasty delights evolve through improv — whether there's too much of an herb that they can't bare to see the frost take, or perhaps not enough so it calls for a substitution. McClare herself is also an avid reader of old cookbooks, so she regularly turns to them for inspo. 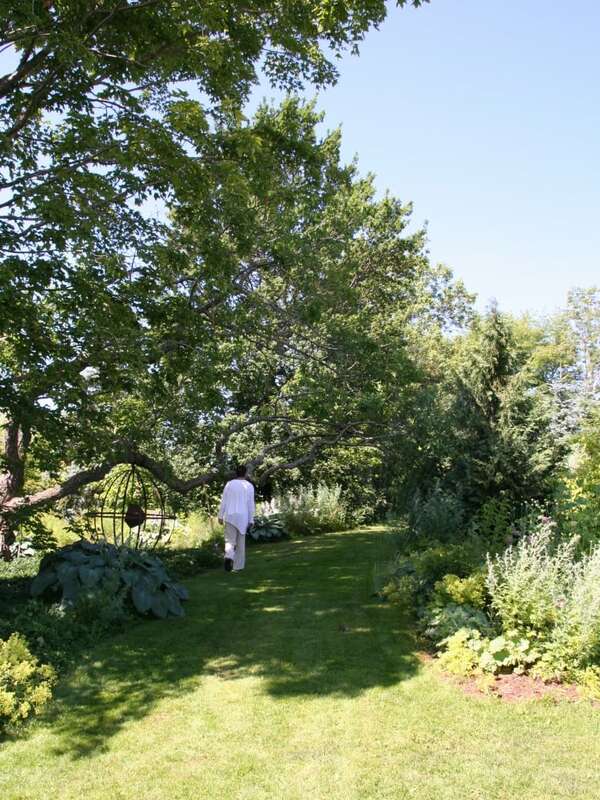 The whole four acres, the jams and all of the jellies bring me back to what she told me during our conversation in the garden: "I was very blessed because my vocation and avocation are the same." And how lucky for us.